In rehearsing for a performance of John Cage’s ‘Sonata for Two Voices’ (1933) at Issue Project Room last winter, guitarist Marco Cappelli and Marc Ribot made a strange discovery. The two guitarists overcame the gap between the rhythmic complexity of the piece and Mr. Ribot’s somewhat limited sight reading skills by ‘looping’ measures: constantly repeating each difficult passage until it became easier. It was in this way they became aware of a strange fact about John Cage’s music that would have probably surprised (and possibly dismayed) the composer himself: John Cage was one funky dude. The resulting project, “Caged Funk”, is a further exploration of this little known aspect the late composer’s work. Tonight’s performance is an open rehearsal. This work was commissioned by and will be premiered July 8,2010 at the Ludwigsburg Festival 2010 in Germany. On June 26th, Marc plays with another super-improv group at (Le) Poisson Rouge – a quintet with guitarist Leonid Fedorov, bassist Vladimir Volkov, John Medeski on keys, and percussionist Ches Smith. Tickets are on sale. 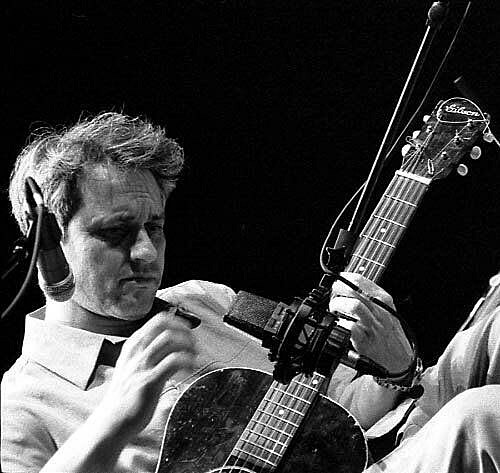 Marc Ribot goes on to play at The Stone on June 29th with bassist Greg Cohen, and for free at the Stuy Town Oval on June 30th with Marc Ribot y Los Cubanos Postizos and La Cumbiamba eNeYe. After that, dates in Canada and Europe.